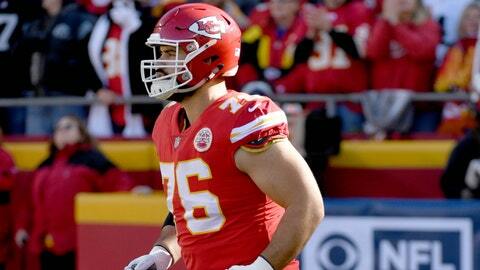 Laurent Duvernay-Tardif is being evaluated for a concussion after leaving Sunday's practice early. ST. JOSEPH, Mo. (AP) — Kansas City Chiefs right guard Laurent Duvernay-Tardif left practice Sunday to be evaluated for a concussion, while defensive tackle Xavier Williams and running back Damien Williams also left early. The Chiefs said Xavier Williams had a stinger and Damien Williams hurt his shoulder. Eric Berry did not participate in practice after skipping the Chiefs’ preseason opener against Houston on Thursday night. Their star safety is dealing with a sore heel. Duvernay-Tardif made headlines this summer when he graduated from medical school in Canada. He was replaced by Andrew Wylie after being evaluated in the Chiefs’ medical tent. Eric Murray and Armani Watts were the starters at safety Sunday, while third-round draft pick Derrick Nnadi replaced Xavier Williams in the middle of the defensive line.